Built in 1994, this 155-bed, full service hospital is located just minutes from the shores of Padre Island. The hospital offers convenient and advanced diagnostic, medical, surgical, obstetric and gynecologic, emergency, geropsychiatric, orthopedic and intensive care services for residents living on the ever growing south side of Corpus Christi. 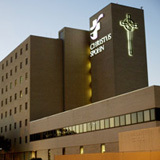 The hospital is also home to a Level III Neonatal Intensive Care Unit that enhances CHRISTUS Spohn Hospital Corpus Christi-South's birthing services by allowing premature babies and newborns with special needs to stay close to their mothers.